They say that imitation is the sincerest form of flattery, so you can imagine that we were pretty darn flattered this morning when we checked our favourite Japanese Tech-News site, Akihabara News, only to find a somewhat familiar-looking perspex case on the front page. Our pal Daimaou, who religiously browses 150 manufacturer websites on a daily basis in Chinese, Korean and Japanese in search of the latest toys, has dug out the Lubic Jules. Yes, the same guys that make that Meccano-esque construction stuff. To the untrained eye, the Jules seems like a novel approach to a computer case: the top half is clear to show off the motherboard, CPU and graphics card, while the boring PSU and hard drives are hidden underneath in a blacked-out box. Long-time bit-tech readers will already spot the link: our very own Dave 'Macroman' Williams built a very similar case nearly 3 years ago. 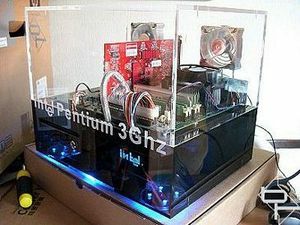 Back in November 2002, we were commissioned by Intel to design and build them a special display PC to celebrate the launch of the Pentium 4 3GHz processor to be used at tradeshows. The product was Project 3G Clear (below right). Aside from the more advanced, curved perspex design, you have to admit they are remarkably similar. Naturally, our case has more flair, with slot-loading DVD drive and Matrix Orbital VFD to display system status, MP3 titles or even just the Intel logo. The Lubic Jules costs 41,970 Yen inc tax, which is about £210 (US$373) - we suggest you have a read of the Project 3G Clear Worklog and have a go at making one yourself. Should modders patent their designs, or is the 'borrowing' of concepts inevitable these days? Have your say.